Nui Cobalt Designs is a quaint little magical internet store that offers a nicely curated collection of handcrafted items from jewelry to candles, tea to perfumes and bathing goodies. 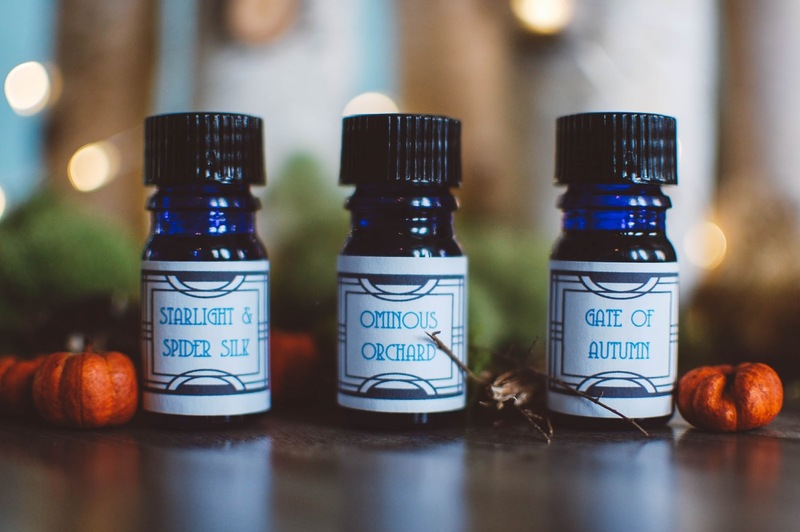 I have purchased several Arcana Wildcraft perfume oils from Nui Cobalt Designs in the past but now that Forest has tried her hand at perfume crafting I knew I wanted to give them a go. These scents are $19 each. Starlight and Spider Silk- Notes: Slender strands of cotton flower hung with trembling dew drops, cold crystalline musk and tiny black vanilla beans. I love the delicate sweetness of this scent. In the bottle, gossamer strands of vanilla waft out on the fresh cottony tendrils of the evening fog. Weaved into the skin the airy musk of fog creeps its ozonic tendrils across the senses. A vanilla musk softness joins the mist and provides an ethereal fragrance experience. A lovely veil of clean vanilla musk. The vanilla gets fluffier and sweeter as it ages on the skin. Ominous Orchard- Notes: Crisp apples, young green growth and a wisp of deer musk accord on the chilly air. I fell for this apple scent hard. Fresh from the cobalt glass dram my nose picks up apples hanging from trees, plump wild pomes with a wreath of greenery as a halo, and some killer musk that has an almost amber woods accord lean to it. I want to pour the whole bottle over my head and twirl about like an anointed one. Once pressed then grafted into the flesh the apple trees smell of seeds and bark, leaves and speckled apple skin, green with life. As it ages and dries, creaking and groaning wizened limbs drip with apples, clinging like so many droplets of blood in the autumn gloaming. It smells of heartwood and the resin that runs through the sapwood, sepia musk and haunted hollows. Gate of Autumn- Notes: Woodland notes of wild fig, ancient oak, scarlet maple leaves and viscous dark resin. Gate of Autumn opens up to reveal a lover's lane strewn with tumbling leaves dressed in scarlet, ochre and umber hues and stately oaks standing sentinel along the sides of the path. Once alighted on the skin Gates of Autumn maintains that leafy and oaken feel with the addition of golden amber orbs drifting through the boughs. The fig pulls more green and sappy on my skin rather than sweet and it adds to the bucolic scene quite nicely. The sillage is about moderate though I did over indulge in Ominous Orchard today and I can smell it wafting about me quite clearly so I bet others can too. Next time I *might* use more caution but I love my scents so who knows. The longevity was about 5-6 hours. Forest has proven to be quite the perfumer and I am thrilled with my purchases and look forward to tucking a Nui Cobalt Design creation in my future orders along with an Arcana Wildcraft or two. If you enjoy an evocative scent, give them a try.